For most woodworkers, a priority on their project list is usually a jewelry box or keepsake box for that special someone. Wouldn't it be great if you could create a unique curved jewelry box instead of the same old square box. Achieving a consistent convex curved box was once a very difficult task for woodworkers and cutting them on the bandsaw was next to impossible. The Convex Curve Cutter (CCC) (Patent Pending) is the long awaited addition to the bandsaw for easy, unique and accurate convex curves. The CCC easily attaches to your band saw and it will accurately cut beautiful convex curves to the sides of wooden jewelry boxes, vases, potpourri boxes, small legs, desktop pen holders and more. You are only limited by your imagination. The CCC will not only cut symmetrical curves, it will allow you to cut asymmetrical curves as well. Note: Wooden decorative boxes are display only. Decorative boxes, flower, pen and hardware for wooden decorative boxes not included. The F.A.S.T is a new take on an old idea. 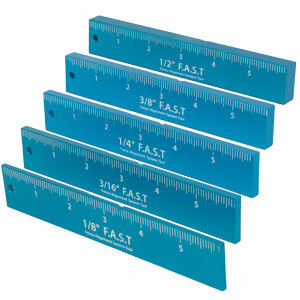 Designed to give you a quick pre set height or thickness gauge for all of your projects. We added a ruler on the front and a rare earth magnet on the back to hold the F.A.S.T in place during set up. The F.A.S.T is made from aluminum and will not damage the teeth of your table saw, bandsaw blade or router bits. For checking alignment, place any F.A.S.T on your band saw blade with the teeth of the blade in the machined groove against the rare earth magnet and adjust your fence so it lines up parallel to the F.A.S.T Bar. To set for cut width, choose the bar that corresponds to your desired cut width and place on the blade as mentioned above. Gently slide your fence against F.A.S.T Bar and lock your fence in place then remove the F.A.S.T and make the cut. 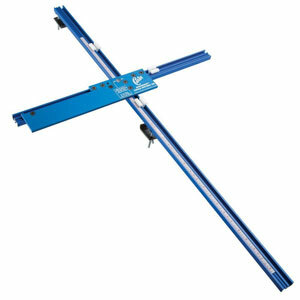 Place a F.A.S.T Bar that corresponds to your desired height for setting up your cutters. Simply raise or lower your cutter until it is flush with the top of the F.A.S.T Bar. Works great for a F.A.S.T setting between your table saw fence and blade as well. Cross cutting logs and squaring the ends to make bowl blanks with a hand saw is common practice, but if you have ever tried it can be very consuming and difficult to do. With the AccuRight® Miter Mill™ you will be able to effortlessly cross-cut and square your logs to any size you need with your band saw. 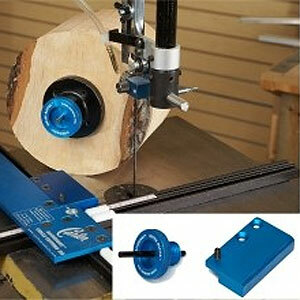 Simply place your log into the AccuRight® Miter Mill™ and position the log for your desired width you want to cut. Turn your bandsaw on and feed your stock through and make the perfect square cut. 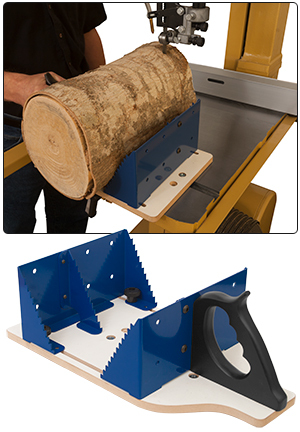 It's that easy to cross-cut your logs using the AccuRight® Miter Mill™. Your log is held in place by the heavy gauge steel tooth v-jaws. The front jaw is adjustable to handle logs up to 9" in diameter or larger depending on your bandsaw capacity. The steel miter guide bar is adjustable to fit a standard 3/4" x 3/8" miter slot on your band saw. Ever find a piece of wood or a log in your firewood pile that would make a beautiful board or book matched piece of veneer, but you just could not figure out how to cut it. The Carter Log Mill™ is the solution. This log mill lets you slice your own wood, veneer or bowl blanks from just about any rough stock or log you have laying around the shop. This simple design incorporates a steel guide bar that uses your miter slot to give you the maximum height for re-sawing as well as even, straight cuts. The heavy duty steel right angle fence keeps the stock from rolling, allowing you to guide the stock through the blade with ease. Adjust the fence for repetitive cuts or once you square off the log you can set up a fence on your saw and slice as many pieces of veneer the log will yield. With wood prices going through the roof, the Carter Log Mill™ will stretch your woodworking dollars by turning that log you were going to burn into your next project. 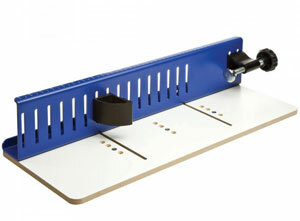 The new and improved Carter AccuRight® Circle Cutting Jig quickly and easily attaches to almost any saw, allowing you to cut perfect circles every time. The Carter AccuRight® Circle Cutting Jig allows you to cut any diameter circle up to four feet, when used with proper external support. With the addition of the adjustable side support assembly, the new Circle Cutter now gives your material even more support when cutting. The AccuRight® Center Master™ Blank Creation System makes it possible to easily and consistently cut and mount circular lathe blanks (for bowl turning, hollow form projects, etc.) using the Carter Circle Cutter (sold separately above ). The device allows even thick pieces of wood to be cut into round blanks and makes it possible to mount these blanks precisely centered onto a lathe faceplate, thus minimizing vibration and getting your project off to a quick and safe start. Precisely cutting the blank also allows you to keep scrap to a minimum and use larger scraps of valuable wood for additional projects. 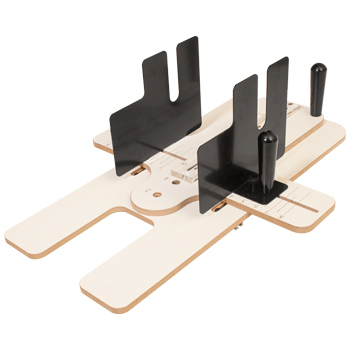 The ACCURIGHT® Center Master consists of two parts: a wide sliding pivot plate for use with the ACCURIGHT® Circle Cutter (sold separately); and the Center Master™ faceplate adapter mounting jig to ensure perfect centering of the finished blank. The Center Master™ is thread specific so make sure you order the correct size for your faceplate.